This eight year old cat is affected by these corneal lesions on a reasonably regular basis. What are you seeing here, what is the cause and is it wise to use some topical steroid to solve the problem? 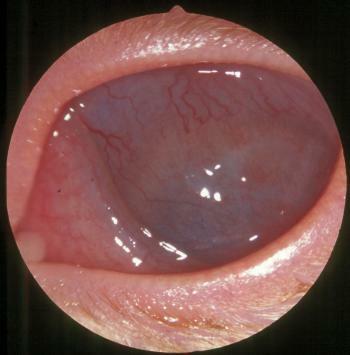 The linear fluorescein-positive lesion is a dendritic ulcer, pathognomonic for feline herpes virus infection. These can resolve on their own, just like coild sores in people, but topical antiviral is valuable. In the States several drugs such as idocyuridine are available but in the UK only trifluorothymidine and acyclovir can be accessed. While many consider the former to be the only useful agent here, we have shown that topical acyclovir, used four or five times daily, can be effective. The key take-home message is not to use steroid. 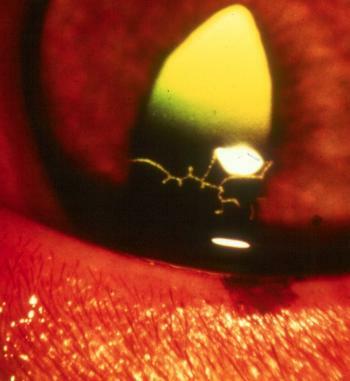 This reduces local immune responses and allows the virus to produce a stromal keratitis, as shown here. This entry was posted in Cases and tagged cat, Herpetic ulcer. Bookmark the permalink. Is this worth worrying about? A dog with a black blob!